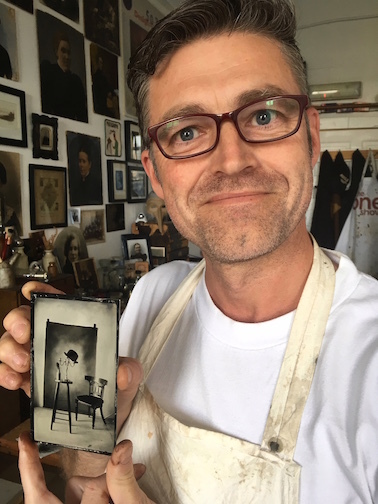 This is Mike, today he reminded me of what a refreshing challenge it is to teach a non photographer the wet plate collodion photographic process. From not knowing about stops, apertures and exposures, to making his own tintypes and ambrotypes. Quite a jump. He soon got to grips with it, after some developer pour issues, this was his last plate of the day. 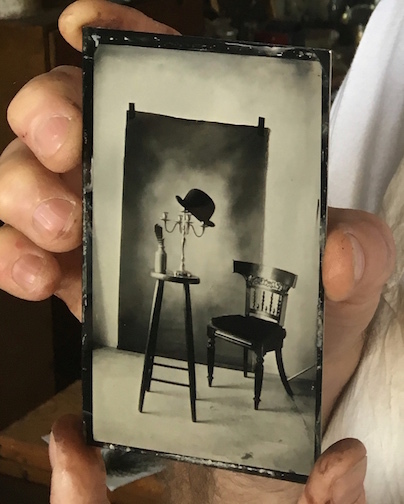 I’d say most wet plate photographers, myself included, get caught up in wanting to buy fancy wooden cameras and brass lenses, today we used the postcard sized Kodak Box Brownie. I’d forgotten what great little plates it makes, proving you don’t have to spend a fortune when starting out in wet plate. The chemicals and additional kit can be pricey enough as it is without the additional cost of camera and lenses? A box Brownie, often found at charity shops, can be bought for only a couple of pounds. I might have to start using it again myself..
26 May This entry was written by Fourtoes, posted on May 26, 2018 at 9:17 PM, filed under Wet Plate..